Penn Avenue Creative Artist-in-Residence Bill Shannon premieres Touch Update, the culmination of a yearlong creative process with KST. Known for creating groundbreaking choreographies that explore the social constructions that surround disabled bodies, Shannon combines movement, wearable projection technology and video installation to explore the significant and often subtle implications of physical human contact in the digital era. Featuring an all-star lineup of Pittsburgh collaborators and performers—including Ron Chunn, Teena Custer, Cornelius Henke, Anna Thompson and Taylor Knight—Touch Update “reverse engineers” Shannon’s virtuosic technique for dancing on crutches, as he dissects and dismantles the multiple online identities we create in order to mask and manipulate our lived experience. 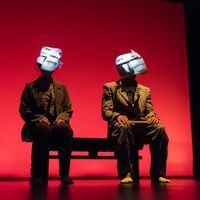 Touch Update is a National Performance Network (NPN) Creation Fund Project co-commissioned by Kelly Strayhorn Theater, Painted Bride, Dance Place and NPN. The Creation Fund is supported by the Doris Duke Charitable Foundation, Ford Foundation, and the National Endowment for the Arts. For more information: www.npnweb.org.